Now, I first reviewed Draugul a few months ago for another release, The Voyager. I was immediately impressed by the Bathory tinged glory of Drauguls music. As far as one man projects go, this was one of the most developed and well thought out. Now with a new record Tales of Loot and Plunder Draugul is taking the black metal triumph to a whole new level. This is the sort of victorious black metal the world needs more of, well developed, well thought out and overall just mind boggling. 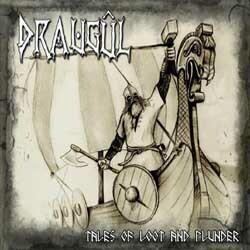 Draugul understands the spirit of black metal and brings it to the fore. As I dig in to Tales of Loot and Plunder I start to realize that one of the main things that makes this record so special for me is the wonderful mix of growls and clean vocals. Really, not a lot of bands get this kind of combination going and deliver it with such skill. On top of that, the song structures are wonderfully engaging with atmospheric keyboards providing a triumphant padding to a glorious black metal attack. The guitar riffs are very tight, they have a great sense of drive behind them which really keeps the listener engaged as they spin the record time and time again. Draugul has clearly evolved since The Voyager (As great as that record is) into a veritable otherworldly force. Tied to the glorious metal of yore and times forgot, Tales of Loot and Plunder will capture the heart of any metaller who loves bands like Summoning. The man behind the project, Hellcommander is a gifted musician and I hope that one day he gets the recognition he deserves. I'm not exaggerating when I say that Tales of Loot and Plunder is one of the best black metal records of 2014, and deserves to be recognized as such. Hellcommander may very well be our generations Quorthon, a gifted innovator who will ultimately save the world from decadent and dull black metal.